Magic Smiles (Chandler) - Book Appointment Online! 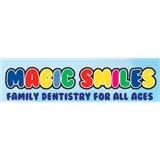 Welcome to Magic Smiles Dental Care! A positive dental experience can impact your child’s smile for a lifetime. We’re committed to providing quality pediatric dental care in an environment that your child or teen can enjoy. Our team of dental professionals is excited about the services we provide, and the influence we can have on young children’s oral health. Your child’s care is an individual experience, and we’re devoted to being as patient as possible to help them through their dental care. We encourage involvement from our patients, so that they can feel that their opinions and needs affect the care we give to them. Comprehensive care starts early on, and can prevent serious dental needs or emergencies from happening when you least expect it. Schedule your child’s first visit with us by the time of their first birthday. The staff is very polite.